5 April 2018, Kongsvinger, Norway. 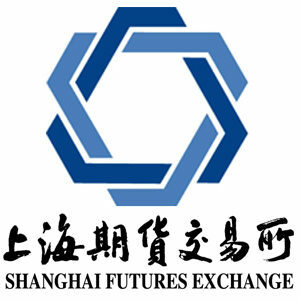 ​NOREXECO ASA​, the Exchange for Pulp & Paper has signed ​a Memorandum Of Understanding (MOU) with Shanghai Futures Exchange (SHFE). The Parties have agreed to jointly make a sufficient effort to enhance market efficiency and activity, and to co-operate with each other on future business that raises common interests. The parties will work together with the purpose of developing areas of cooperation such as information sharing, education and potential exchanges of employee training. 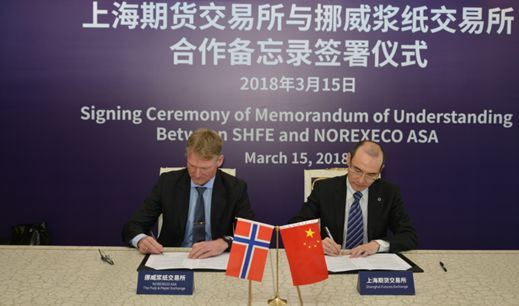 This agreement increases the opportunity to engage Asian interest into the international pulp and paper market to a much larger extent, says Stein O. Larsen CEO at NOREXECO. The MOU was signed in a formal signing ceremony by CEO of SHFE Xi Zhiyong and CEO of NOREXECO Stein O.Larsen in Shanghai the 15. March 2018. NOREXECO is a regulated commodity exchange specialized for the global pulp and paper industry. NOREXECO offers trading in cash settled financial futures. These instruments are used to manage price risk for producers and consumers as well as being a trading opportunity for commodity trading firms. In cooperation with European Commodity Clearing AG, we offer efficient clearing services, which enable all NOREXECO ASA members to substantially mitigate counterparty credit risk, while at the same time optimize market exposure.